Update 22/08/13 (see right hand column) - Houcine has ended his hunger strike following a humanitarian visit from Cllr Afzal Khan in his capacity as the Executive Lead on Children and Families for Manchester City Council, along with two Moss Side Councillors, Alistair Cox and Roy Walters. After a 13 year struggle to achieve safety, a Manchester family are living on tenterhooks each day in their Moss Side home after the Home Office refused their asylum and human rights claim on July 12th. Three days later, on July 15th, the father, Houcine, who is originally from Algeria, began a hunger strike. Drinking only water, he is at home with his Bosnian wife, Alma, and their three children, all of who were born in the UK. The eldest child is 11 and is now entitled to register as a British citizen. The Home Office say that Houcine cannot stay here because of a conviction handed down by an Italian court, which was undefended and for which Houcine has since been pardoned. The Bosnian state authorities operate a policy of returning those originally from Arabic countries to their countries of origin, without regard to their family, children or any ties to Bosnia. There are already many examples of this policy, increasing the likelihood that Houcine would be sent directly to Algeria immediately upon arrival in Bosnia. The three children of the Senoussaoui family were all born in the UK. The eldest son, being 11 years old, is entitled to register as a British citizen in his own right. One of his two sisters is almost 10, the other is four. They are all settled here, having never known life anywhere else. As of 27/07/13 Houcine’s hunger strike is on Day 12. After 29 days on hunger strike Houcine Senoussaoui, who alongside his wife Alma has been fighting for 13 years to achieve safety for their three children and themselves, agreed to resume eating. This followed an approach by RAPAR to Cllr Afzal Khan in his capacity as the Executive Lead on Children and Families for Manchester City Council. Cllr Khan visited Houcine, Alma and their children at their home along with two Moss Side Councillors, Alistair Cox and Roy Walters. Cllr Khan explained: “As councillors, we have no jurisdiction over asylum claims but, on a humanitarian level, my colleagues and I wanted to visit Houcine and his family to ensure their welfare during what has been a difficult and traumatic time. Houcine started his hunger strike on 15th July, three days after the Home Office refused the family’s asylum and human rights claim. 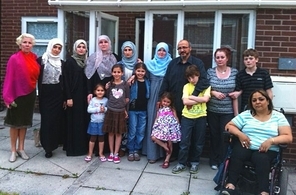 All their children were born here and their eldest, being 11, has his own British passport. But the Home Office said that Houcine could not stay in the UK because of a conviction handed down by an Italian court – even though the charge was undefended and Houcine has since been pardoned by the court in Milan. Houcine believed a hunger strike was the only option he had left to fight the Home Office’s continued refusal of his asylum claim and to publicise the injustice he had encountered. The councillors reassured Houcine that they are aware of the case and want to do everything possible to support the family and the children until a resolution can be found. Houcine's solicitor has submitted an appeal against the Home Office decision to reject the asylum claim. But currently, following drastic cuts in public spending on legal services, there is a delay of up to 16 weeks before appeals in immigration cases can be heard. Alma, the mother of the family, is from Bosnia, where the couple first met. While they were there, an attempt on their lives by the Algerian security forces resulted in serious injury to both of them, a miscarriage for Alma, and two years in a wheelchair while she recovered. When they arrived in the UK in 2000, Houcine applied for asylum because of threats he received in Algeria and which continued when he and Alma lived together in Bosnia. The Home Office accept that, if Houcine is returned to Algeria, he would be subject to imprisonment and torture. But they say that, as Alma is a Bosnian national, he would be safe in Bosnia, and they expect all the family to return there. However, the Bosnian state authorities operate a policy of returning those originally from Arabic countries to their countries of origin, without regard to their family, children or any ties to Bosnia. There are already many examples of this policy, increasing the likelihood that Houcine would be sent directly to Algeria immediately upon arrival in Bosnia. As of today Houcine has been on hunger strike for 28 days (four weeks). Please spare a few minutes to email the Home Secretary and the Minister for Immigration, and your local MP. (Although MPs will not act directly on behalf of someone who is not their constituent, they have in the past been willing to lend their name in support of the relevant MP, in this case Lucy Powell for Manchester Central.) Model letters are available below if required - adapt as you see fit and paste into the body of the email (rather than attaching as a Word doc), but be sure to include Houcine's Home Office reference number S1081428 and the main points of the case. Click here for a model letter to email to the Home Secretary and to the Minister for Immigration. Click here for a model letter to email to your MP asking her/him to support Lucy Powell regarding Houcine's campaign. MPs' email addresses can be found by searching here (enter your postcode, click 'Find MP', and then click on the MP's name when it comes up). Houcine began his hunger strike on 15/07/13. This page has been set up to provide information and up-to-date bulletins on the family's campaign. News and updates will appear here.